We’ve mentioned a few times how powerful and vital the right keywords can be. It’s even been discussed at length how you can identify these keywords, through understanding various criteria, including your target audience. What isn’t often talked about, is what tools you can use to find them. Of course, Google Keyword Planner has a certain importance, but it is also worth noting that Google isn’t the only search engine available. 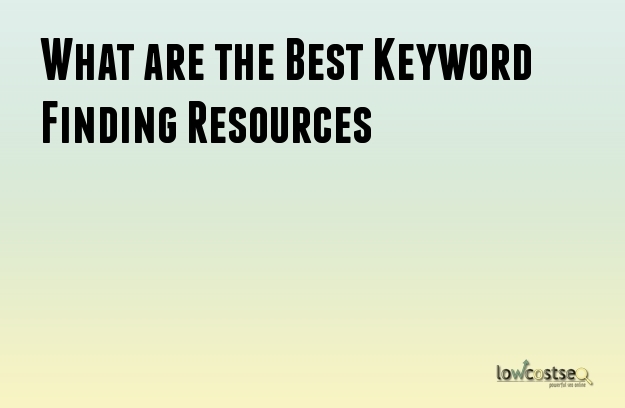 Keywords are vital for both SEO services and PPC advertising, so having the right tools and resources is an absolute must. Answer The Public isn’t a keyword finding tool, per se, but it’s a great way to build upon your keywords. By typing your chosen anchor text into this website, the system will find the most common questions or search terms based around this phrase. This lets you do two things of high importance. First of all, it lets you phrase content around the questions people are asking. Secondly, this can subsequently be used to generate some long-tail keyword results and get the low hanging fruit – results that don’t have the highest search volumes, but have a lower competition and, often, a high click through rate. There are a number of tool’s like this, but Wordsteam’s Keyword Tool offers a great quality and it also happens to be free. The main benefit to this tool is that it allows you to group keywords together or form ad groups, without going into the technical detail of a Google ad campaign. While this has benefits for PPC, it’s still great for finding new keywords based on your existing options, allowing you to branch out more successfully with new terms. Finally, while it only works with Firefox, Rank Checker is a great tool for filtering the results given via the likes of Google Keyword Planner or Adtools. When dealing with large amounts of information, apps like this are vital to cutting to the data you need. Not only does this help account for options outside of Google – such as Yahoo – it can also turn off personalised ranking results. This something many SEO professionals forget, leading to simple mistakes. Put simply, since you often look at your own website, your Google account prioritises the website higher than a typical user might see it. Rank Checker gives you the more honest results, which are more useful to you.